Gov. Rosselló, flanked by cabinet members, announces the RSA reached between the GDB and its creditors. Gov. Ricardo Rosselló announced Monday that the Puerto Rico Fiscal Agency and Financial Advisory Authority (AAFAF, for its Spanish acronym) and the Government Development Bank of Puerto Rico have entered into a restructuring support agreement (RSA) with a significant portion of its major stakeholders. Pursuant to Title VI of the Puerto Rico Oversight, Management, and Economic Stability Act (PROMESA), the RSA terms will be implemented pursuant to a Title VI consensual restructuring plan for about $3.9 billion of GDB debt. Once approved by the requisite creditors of GDB, the Financial Oversight and Management Board for Puerto Rico and the U.S. District Court for Puerto Rico, the plan as implemented will provide for GDB’s financial creditors, including holders of bonds and depositors, to exchange their claims against GDB for one of three tranches of bonds issued by a new municipal entity, at each creditor’s election. These new bonds will have varying principal amounts, interest rates, collateral priority, and other payment terms. As part of the terms of the RSA, GDB’s financial creditors have agreed to substantial discounts to the principal, he said. “This agreement is an example that the Government is regaining the credibility it had lost over the past few years. We are satisfied with this agreement that will result in the best interests of the people of Puerto Rico,” Rosselló said during a morning news conference. The restructuring does not depend on any funds from the Commonwealth’s general fund. The RSA also contemplates a cash payment to Puerto Rico’s municipalities that hold accounts in the GDB. This agreement comes after the RSA already achieved by the AAFAF, representing the Puerto Rico Electric Power Authority (PREPA), the Ad Hoc Group of PREPA bondholders, suppliers of fuel credit lines, monoline insurers and the Economic Development Bank of Puerto Rico, which achieved savings of $ 2.2 billion for the people of Puerto Rico. “On behalf of AAFAF and the administration, I want to express my gratitude to GDB and its major constituents for working tirelessly to reach a consensual deal. 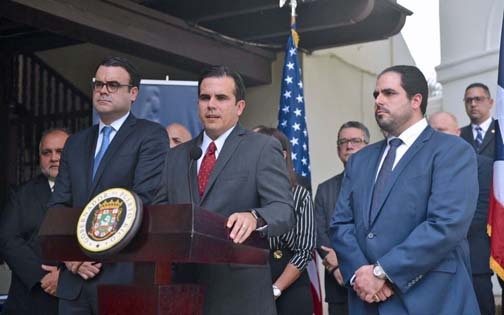 The successful restructuring of GDB’s obligations as provided for in the RSA represents significant progress in Puerto Rico’s economic recovery,” Portela said. The RSA for the GDB has been negotiated by representatives of, and approved by (among others): (i) the Ad Hoc Group of Bondholders, comprised of funds managed or advised by Avenue Capital Management II, L.P., Brigade Capital Management, LP, Fir Tree Partners and Solus Alternative Asset Management LP, (ii) credit cooperatives of Alianza de Cooperativistas (Alianza) and of Grupo ES (which together are composed of more than 40 credit cooperatives) and (iii) Bonistas del Patio. “The Ad Hoc Group looks forward to the completion of definitive documentation and the prompt implementation of the RSA under Title VI of Promesa,” he said. “This agreement adds to the necessary determinations to continue protecting the assets and continue to develop cooperativism on the island,” the Alianza de Cooperativas added. AAFAF and GDB were assisted in the negotiations by O’Melveny & Myers LLP, as legal advisor, Rothschild & Co., as investment banker, Ankura Consulting Group, as financial advisor, and Bank of America Merill Lynch, as dealer manager. The Ad Hoc Committee of Bondholders was assisted in the negotiations by Davis, Polk & Wardwell LLP, as legal advisor, and Ducera Partners LLC, as financial advisor. Atlas Asset Management, LLC is the financial advisor to both Alianza and Grupo ES. Marichal, Hernández, Santiago & Juarbe, LLC are attorneys for Grupo ES, González Torres & Co., CPA, PSC are accounting advisors for Alianza and HRML & Asociados, LLC and Nevares, Sánchez Alvarez and Cancel, PSC are legal counsel for Alianza. Bonistas del Patio was advised by Pico & Blanco, LLC, as legal advisor, and Jorge Irizarry and Carlos Rodriguez as financial advisors. Hey Buddy!, I found this information for you: "GDB, creditors reach debt restructuring agreement". Here is the website link: https://newsismybusiness.com/creditors-restructuring-agreement/. Thank you.